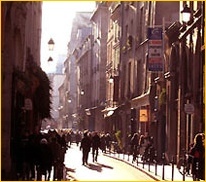 There is no doubt the Marais is the most specialised fashion area of all in Paris. International "Haut de gamme" brands stand next to small creative and original designers with items made in France and made in Europe. 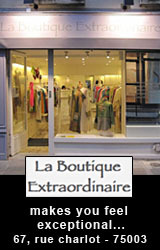 You will find in these women's fashion shops, all kinds of unique clothing, accessories and souvenirs that you will never find anywhere else. Le Marais has a number of public parks and gardens springtime visitors shouldn't miss. Our favorite is Place des Vosges (originally named "Place Royale" during the time of Louis XIII and inaugurated in 1612). It is an absolute square, surrounded by perfectly symmetrical brick and stone apartment buildings sitting atop a colonnaded walkway. Under the arches are some of Paris' chicest designer boutiques, art galleries, three-star restaurants and four-star hotels. Planted with well-pruned square-shaped trees, there are patches of lawns that only a few years ago were opened to the public for trespassing on -- sunbathers and picnickers quickly spread their blankets. Children play in the sandboxes and the harmony of the scene is entrancing. Don't be afraid to peek in. Very often, the "digicode" allows entry during the day with the press of one button and what you will discover are quiet cobblestone courtyards and lovely gardens. Those who live in the converted apartments of these private mansions overlooking such serenity cannot help but to truly love living in Le Marais! This « cabinet de curiosités » encompasses the mineral, vegetable and animal worlds. The new collection uses garden vegetables and insect shells to create design objects and accessories. You can also discover shrimp life in an ecosphere (from 99 €). 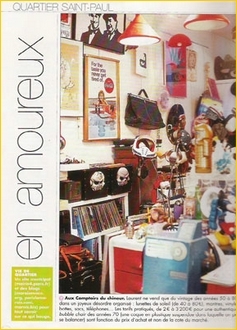 All of Elle à Paris’ favorite brands are on rue François Miron. At Pierre Azagury’s shop, discover his own ceramic creations (vases for 17 €) as well as notebooks by Madame Mo, bags by Jack Gomme, and objects by Press Citron…not far away, Sentou and Happy Home also rank among the best design shops of the capital. 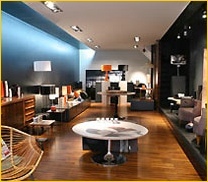 Dishware, home decoration, furniture…the selection is chic and beautiful. This shop promotes French and foreign designers who you won’t find anywhere else. For example, for 80 €, the rechargeable electric candles by Jean-Luc Le Deun. The two children of Lethi Tran, creator of the brand Sensitive, have each opened a boutique. One at rue Faidherbe, and one here, at rue François Miron. Manufactured in Asia, the clothing follows clean lines. 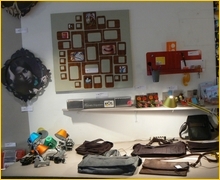 Mao jackets are 61 €; accessories, a line of childrenswear, as well as new and old furniture are also available. Ethnic decor and large windows, we rushed to try their Mediterranean dishes : lamb shoulder, polenta with rosemary sauce, red berry and caramel panna cotta. A very reasonable 30 € a la carte per person. Thai culture is found here in the two skincare lines. The Harnn line combines the benefits of rice oil and tropical plants. Thann is a more technical line but still made from vegetable products. All products contain no preservatives and are never tested on animals. The advantage of this new spa : modelage while being misted by essential oils (30 € for 45 minutes). This store sells its own line of creations : rugs, jewelry, and bracelets made of natural grains. Laurent only sells vintage items from the 50’s to the 80’s in a happily organized clutter : sunglasses (from 40€ to 80€), watches, records, boots, bags, telephones…the prices are from 2 € to 3200 € for an authentic 70’s « bubble chair » (a plastic egg suspended from the ceiling that you can swing in) and are based on purchase price and not on market value. Real finds for new and used records. Specializing in classical music, the store stocks quite a lot of jazz and pop-rock as well. Prices vary from 1 € to 100 €. And for those who want to clean out their collection, you can also re-sell or exchange your old albums. Re-issues of contemporary furniture by famous architect Oscar Niemeyer, superb and unique pieces made from exotic Zanine wood : this new space opened by a Brazilian passionate about designers from his own country is well worth the trip. But expect a price tag of 7000 € for a meridien by Niemeyer…or, settle for one of his lithographs. The menu here changes every day. At lunchtime, a large plate (meat or fish with a vegetable and cheese) is only 10 €, entrées are from 14 € and appetizers are from 6 €. 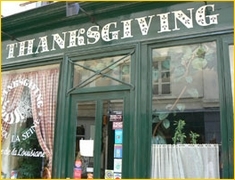 This little restaurant is also a wine celler with a great selection from the Corsican island île de Beauté. Jeremy bargain-hunts for fabrics and leathers from the 40’s to the 70’s and transforms them using dyes, detergents, or bleach. His men’s collection of shirts, sweaters, and coats are very elegant and he has also just launched a line of limited edition sweaters for women for 130 €. 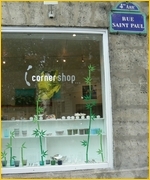 It took a surprisingly long time to happen considering its proximity to the heart of the boutique-saturated Marais, but the “upper” Rue Vieille-du-Temple (between the Picasso Museum and the Cirque d’Hiver) has finally blossomed into a center for chic clothing shops and galleries specializing in design and contemporary art. On days when the galleries are holding openings, the street swarms with artsy types who are sometimes more colorful and interesting to look at than the artwork. 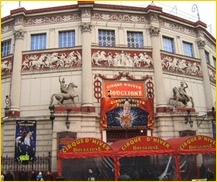 Here’s a door-to-door survey of the street’s retail topography, starting at the Cirque d’Hiver end. 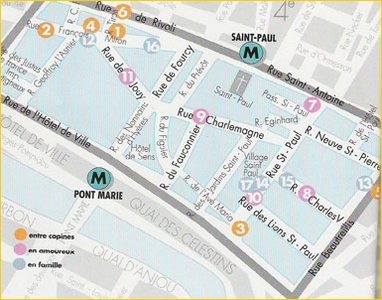 A detour on Rue de Poitou and Rue Charlot leads to more trendy shops and galleries. Oneninesixone. Young designer Gaëtane Raguet refurbishes teak furnishings from the 1960s and covers them with her own low-key, retro-style fabric designs, creating a handsome mix of old and new. 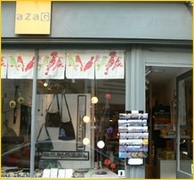 The shop also offers lamps, vases and objects by other designers whose work complements hers. No. 135. Tel. : 01 42 72 50 84. Centre Culturel Mexicain. The gallery of the Mexican Cultural Center, one of the pioneers in the neighborhood, presents works by Mexican artists. On show to Nov. 19), “Telenovellas,” photos by Stefan Ruiz. No. 123. Tel. : 01 44 61 84 43. No. 123. Tel. : 01 42 72 60 03. Galerie Rabouan Moussion. This contemporary art gallery is currently showing Russian artist Kirill Chelushkin’s “Snow People” installation and paintings. No. 121. Tel. : 01 48 87 75 91. A.P.C. An outlet for the hip A.P.C. label’s simple, well-made basics for men, women and children. No. 112. Tel. : 01 42 78 18 02. ToolsGalerie. A design gallery selling both one-of-a-kind and limited-edition productions of the work of such well-known designers as Marcel Wanders, Hella Jongerius, Radi Designers and Olivier Sidet. No. 119. Tel. : 01 42 77 35 80. NeC Nilsson et Chiglien. Classic Scandinavian furniture and ceramics. No. 117. Paris. Tel. : 01 42 77 88 83. Galerie Xippas. The light-filled rooms of this upstairs gallery wrap around the courtyard housing the Yvon Lambert gallery below. On show until October 22: “Colored Circle Paintings” by British artist Ian Davenport and paintings by Lisa Milroy. No. 108. Tel. : 01 40 27 05 55. Yvon Lambert. This leading contemporary art gallery, one of the first to set up shop in the neighborhood, has expanded to include a bookshop and “project room,” which is now showing Mario Maffei’s works on paper. No. 108. Tel. : 01 42 71 09 33. Bault. A tiny boutique selling MarielleThiebault’s handmade women’s clothing and Makabu’s vintage and new clothing decorated with intricate embroidery and collages made with everything from bits of rice bags to scraps of fur. No. 106. Tel. : 01 42 78 61 49. Maud Perl. The designer Maud Perl’s elegant, pricey women’s clothing in jewel-like colors is made from the finest fabrics – mostly silk, with some cashmere. No. 106. Tel. : 01 42 71 30 87. Laurent Daniel. Industrial antique furniture and lighting, with everything from filing cabinets to a factory trash bin (possible laundry basket?). Vanessa Bruno. The designer known for her handsome, wearable clothes will open a new shop on the street at the beginning of November. Galerie le Troisième Oeil. Currently showing paintings by Brazilian artist Gianguido Bonfanti. No. 98. Tel. : 01 48 04 30 25. 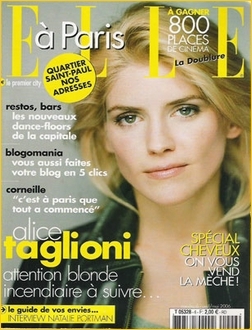 For a nearly complete listing of Paris’s contemporary art galleries, with exhibition info and dates of openings, pick up a copy of the excellent Paris-Art magazine in a gallery or consult its Web site at www.paris-art.com. Designer of women’s clothing, handbags and fashion accessories. A very feminine line of clothing. A very feminine line of clothing whose Moroccan tunic will be enjoyed by adults and children alike! 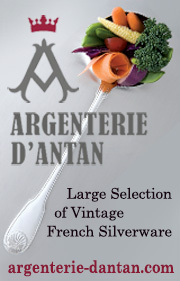 The latest Haute Couture collection for women and a few Haute Couture items for men. Every month the boutique invites a fashion designer and presents his or her unique line of clothing inspired by Issey Miyake ‘s unique pleats. Issey Miayké’ s innovative line of clothing. You will delight in the soft colors and elegant patterns of this very feminine line of clothing. A Polish designer’s collection of very feminine clothes and jewels. Women’s casual apparel infused with an ethnic touch. A line of clothing with a street-wear touch whose black denim pants are already a celebrity must-have. A couple of French designers who work with cashmere to create clothes with a sportive touch. A line of clothing with graffiti-inspired colors and style. Le Marais is the place where this luxurious brand has decided to open their newest boutique. To make you feel like a child again. Finger puppets, hats, mittens and fancy, colorful sweaters, all hand-made by this “knitting designer”. Elegant footwear for man and woman, a french trademark from Alsace. A wide selection of sportive footwear. The original Birkenstock “footbed” in many different styles of sandals and shoes. Designer handbags, purses, wallets, etc. that are both fashionable and practical. Vintage millinery items that will take your breath away.